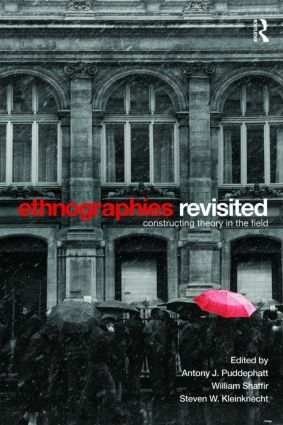 Ethnographies Revisited provides first-hand accounts of how leading qualitative researchers crafted key theoretical concepts found in their major book-length ethnographies. Great ethnographic research lies not in the rigid execution of prescribed methodological procedures, but on the unrelenting cultivation of theoretical ideas. These contributors focus squarely on this neglected topic, providing reflexive accounts of how research decisions were made in light of emerging theoretical questions. The continuous generation of creative concepts is arguably the most important skill in developing powerful results in field research, since the originality of the ideas produced is how the study is ultimately judged. Yet, this topic is often taken for granted, treated rigidly and artificially, or is entirely absent from existing qualitative research manuals. In contrast, this volume offers candid insights of how leading ethnographers generated their initial questions, chose their research sites, made theoretical and methodological adjustments, and oriented their research to maximize the conceptual payoff, leading to such successful research contributions. This provides a fresh approach to the topic of qualitative research, by linking practical decisions in the field to the dynamic features of theory in the making, told through the first-hand experiences of some of the best ethnographers in our field.